The retina is the neural part of the eye responsible for vision and the pattern of blood vessels serving the retina is as unique as a fingerprint. The technology that scans the retina is known as retinal scanning. The true target for the scan is the capillary pattern in the retina. The process relies on generating images of the retina using a low-intensity light source. In the 1930s retinal capillary patterns were suggested to be unique, but the technology used to exploit this information was developed much later. Although military and high-security use of photographic retinal scans began decades earlier, by 1985, retinal scan technology became available for computerized biometric identification and commercial security use. Retinal scans are just one of the biometric methods using the eye for personal identification. Two years after the first retinal scanner was developed in 1987, Leonard Flom and Aram Safir patented the use of the iris as a personal identifier. However, it was not until 1994 when John Daugman developed the technology for iris scanning that is became useful, and since then iris scanning has begun to challenge the retinal scans. Currently a number of companies claiming that they perform retinal scanning, in reality are performing iris scans. Retina scanning procedures. Retinal scans are based on the presence of the fine network of capillaries supplying the retina with oxygen and nutrients. These vessels absorb light and can be easily visualized with proper illumination. Retinal scans require close contact of user and scanner, a perfect alignment of the eye with a scanner, and no movement of the eye. The examiner is required to keep the subject's eye within half an inch of the instrument. The subject must focus on a pinpoint of little green light (to properly align the eye) and avoid blinking. A low-intensity coherent light is then transmitted through the eye and the reflected image of the retinal capillary pattern is recorded by the computer. 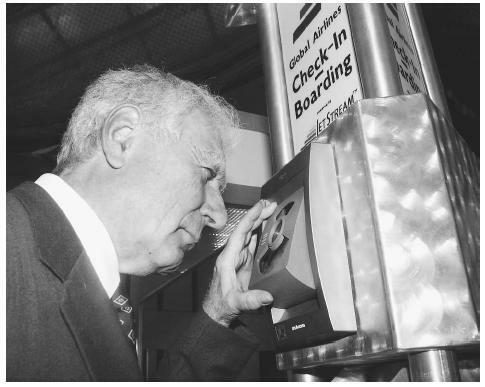 An executive demonstrates a retinal scanner used for identification at the International Air Transport Association security symposium in Atlanta in 2001. Although retinal patterns are generally thought to be constant during a person's life, they can change in case of diabetes, glaucoma, retinal degenerative disorders or cataracts. Therefore, although retinal scans are nearly 100% accurate they cannot be used as a universal security measure without making allowances for normal changes. An initial scan (enrollment) takes a minimum of five scans and lasts approximately 45 seconds; subsequent authentication scans are faster and take only 10–15 seconds. An acquired image containing 320–400 reference points is converted to a map of the retina and used to identify a match from the templates encoded in the scanner's software. Retinal images captured are extremely small, only 35 bytes in size. Retinal scans versus iris scans. Retinal scans are considered to be too intrusive for a general security use and the prolonged exposure to light emitted by the scanners might be harmful to the eye. As a result a strong competition to the retinal scans was launched by iris scanning technology. The number of companies offering iris scanning are increasing. The main reason is the fact that the iris is also unique and offers high confidence in identification. There is only a chance of one in 10 78 that two irises will be identical. Iris scans use the characteristics more similar to fingerprints than to the retinal vein pattern. The colored part of the eye appears to be as unique as fingerprints and retina. Scanning technology takes advantage of crypts, furrows, ridges, striatations, ligaments, and collarette. While 240 points are recorded, the image size is 512 bytes, over ten times larger than a retinal scan. The main advantage of the iris scans is the ability to perform them from a distance of up to three feet and short time of scan of only 20 seconds initially, with subsequent identification requiring only two seconds. Glasses and contact lenses do not interfere with the scanning process and identification. Scanners. The technology for retinal scans has changed in recent years. The initial large devices are now being replaced by smaller and more accurate instruments. The first commercial retinal scanner was developed by Eye Dentify in 1984 with the launch of the Eyedentification 7.5 personal identification unit. One of the most recent developments in the area is a small mobile and easy to use retinal scanner developed by Retinal Technologies from Boston. Although it was initially developed for diagnostic purposes it will be available as a security tool as well. Fooling the retinal scanner is very difficult, as they require intact retinas to complete a scan. Following death, the retina degrades very quickly and thus cannot be used in most cases for accurate post-mortem identification. Although often a popular movie special effect, using a retina detached from a cadaver would fail to pass notice by modern scanning equipment. Likewise, surgical alteration of the retinal pattern would be not only a dangerous and extremely expensive process, but the changes introduced would be readily detected by modern scanning equipment. In contrast to the retinal scanners, iris scanners are of two main types: active and passive. The active system works from 3 to 14 inches and also requires the user to move forward and backwards so the camera is adjusted properly. In contrast the passive system can work over longer distances one to three feet. The main technology developer is Iridian Technologies, which holds the patents to the concepts and technologies involved. Security uses of retinal and iris scans. Biometric techniques are used in identification and authentication. The features used for the two processes can overlap or can be different. Authentication requires high accuracy to ensure restricted access. Retinal and iris scans offer high accuracy, and the primary users of retinal scans are military and government facilities, such as CIA, FBI, and NASA. Scans are used to control access to high security areas. The technology is currently spreading beyond these institutions and is being used by Cook County Prison in Illinois (to ensure the identity of the prisoners) as well as General Dynamics (a defense contractor). Some of the Japanese banks use retinal scans in ATM machines to prevent unauthorized use of the system. Trials in the USA with biometric ATM security are using iris recognition systems instead. However, in Illinois retinal scans in conjunction with fingerprinting are used to prevent welfare fraud. Acceptance is growing for the iris recognition systems and they are now used by government agencies, commercial companies, and in the public sector. Among the government users are the U.S. Congress and the Departments of Defense, State and Treasury. Commercial companies that protect themselves by using iris recognition include Bank United, GTE, Hewlett Packard, Lockheed Martin, and British Telecom. Other places with restricted access areas, including airports, have acquired scanning technologies in the wake of the September 11, 2001, terrorist attacks upon the United States. Scanning technology systems were recently installed at Charlotte (North Carolina), Amsterdam (Netherlands) and Frankfurt (Germany) mainly for security purposes to check the employees and provide controlled access to the secure areas of the airports. Studies are underway to test if scanning technologies can be used to facilitate rapid check in and to streamline border crossing. The Schipol Airport in Amsterdam is one of the most recent airports to test the iris recognition system. The details of an individual's iris are stored on a special card and a subsequent check-in is performed by a simple iris scan to confirm identity. Eight of the largest Canadian airports (Toronto, Vancouver, Ottawa, Montreal, Halifax, Winnipeg, Calgary and Edmonton) plan to install similar systems by the end of 2003. Scanning is also becoming part of security measures for sports and entertainment venues. For example, organizers at the 2002 Sydney Olympics used an iris scanning system termed Eye Ticket. Use of retinal scans outside the high security areas is, in many areas, being replaced by iris scanning, which is easier to perform, is less intrusive for the user, and provides adequately accurate identification. Ashbourn, Julian. Advanced Identity verification. The complete guide. London: Springer Verlag, 2000. French, M. "Retinal eyes biometric security. Company reveals its scanning technology." Mass High Tech, The Journal of New England Technology, 32 (2001). DORO Inc. < http://www.dorosecurity.com/index2.html > (14 December 2002). Court Technology Laboratory. "Biometrics and the Courts. Individual biometrics." < http://ctl.ncsc.dni.us/ > (14 December 2002). Find Biometrics. The complete biometrics resource guide for identification and verification. < http://www.findbiometrics.com/index.html > (14 December 2002). Global Analytic Information Technology Services. "Retinal scanning." < http://www.gaits.com/biometrics_retinal.asp > (14 December 2002). IridianTech. < http://www.iridiantech.com. > (14 December, 2002).